It is a great feeling to be baking once again, especially with the talented bakers in the #BundtBakers group. 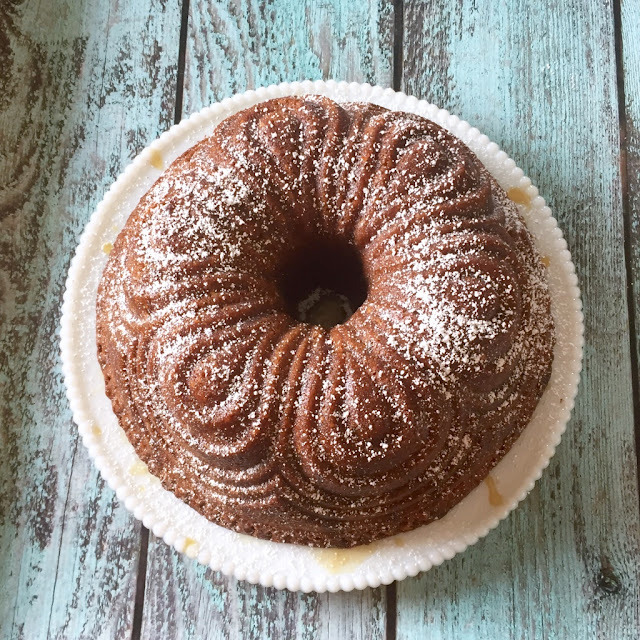 A bundt cake is one of my favorite cakes to make, whether it be plain or decorated, and they always seem to keep so well. A little whipped cream, ice cream, or vanilla custard served on the side never hurts either. 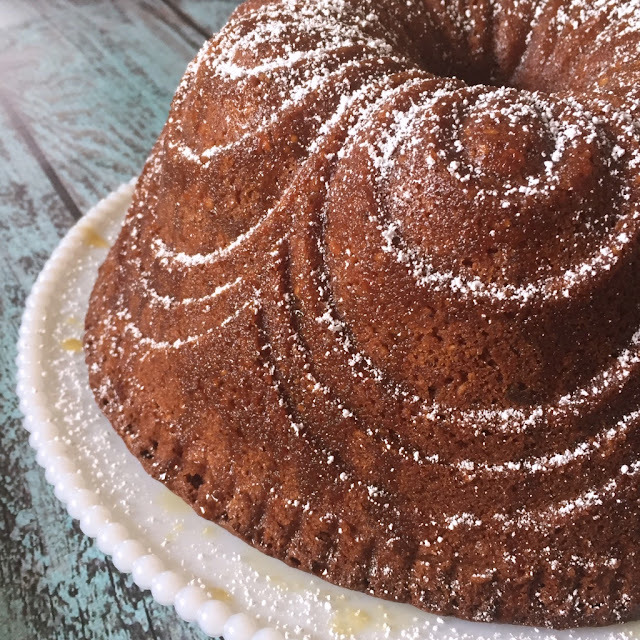 There are so many fantastic bundt cake pans out there that it is easy to become a collector of them. 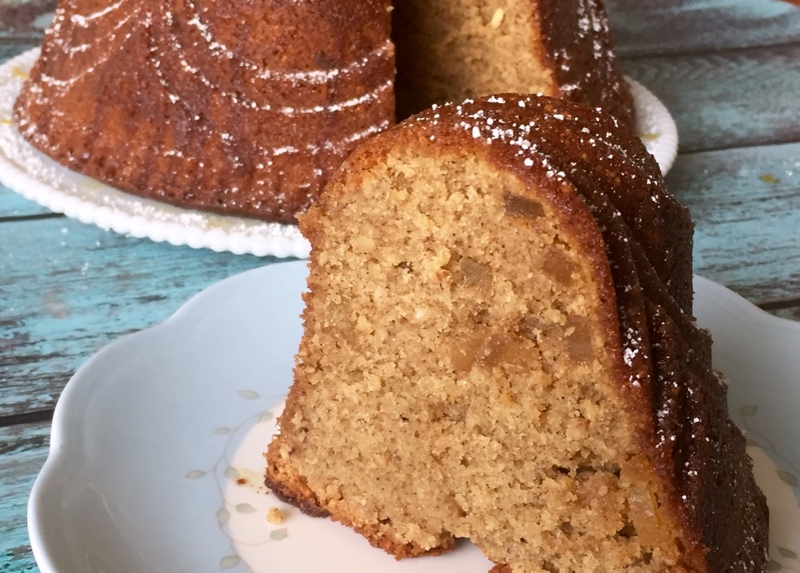 The pan I used in this recipe, the Chiffon Bundt Cake Pan, has special meaning to me. It was sent to me by two special friends to lift my spirits during a difficult time. I had no idea it was being sent to me until the box arrived at my door. For this reason it will always be my favorite bundt pan. This is the perfect time of year to use warm spices in your baking - nutmeg, cinnamon, allspice and ginger - all blend together to warm your soul. I am a big fan of ginger in general, and love it in both sweet and savory dishes. This recipe really amps up the ginger flavor with both ground ginger and crystallized ginger in the cake. The kitchen smelled amazing as it baked and it was equally delicious when it was on my plate. The ginger is front and center, but it is slightly tempered by the other spices and makes it seem a little like gingerbread, but it looks nothing like gingerbread. 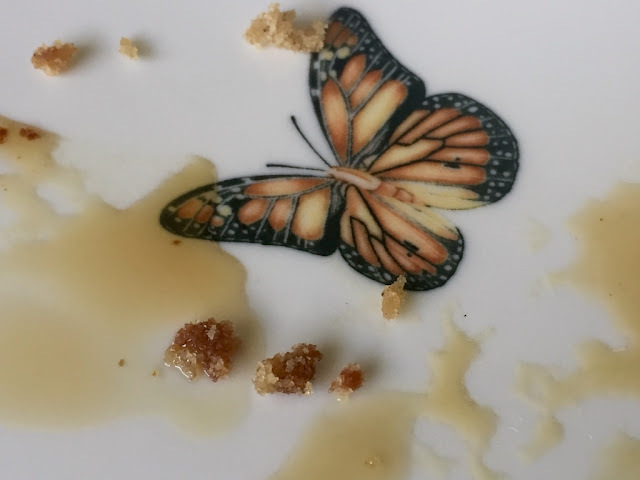 I also loved the pieces of chopped ginger that I got in each bite of cake. The caramel sauce however, well lets just say I am still on the fence about it. It tasted just fine but I guess I am used to a thicker caramel sauce, so I'll leave it up to your discretion as to whether you make this sauce, or substitute another caramel sauce in its place. If you would like to know more about #BundtBakers and see what the other bakers made for the Naughty or Nice theme please scroll down below the recipe. Thank you to Olivia from Liv for Cake for hosting this month and choosing the Naughty or Nice theme. Arrange a rack in middle of oven and preheat to 180°C. Generously coat a 10-cup Bundt pan with baking spray. Place butter in a medium saucepan over medium heat. Scrape in seeds from vanilla bean and add the bean. Cook, stirring often, until butter foams, then browns (careful not to burn), about 5 minutes. Remove the vanilla bean and pour brown butter into a medium bowl. Chill until slightly firm, about 45 minutes. Place flour and almonds in the bowl of a food processor and pulse until almonds are finely ground. Transfer to a large bowl and whisk in baking powder and next 7 ingredients; set aside. Using an electric mixer on medium speed, beat brown butter, brown sugar, sugar, and ¾ cup powdered sugar in a large bowl, frequently scraping down sides and bottom of bowl and beaters. Continue to beat until light and fluffy, about 5 minutes. Mix in lemon zest. Add eggs one at a time, beating to blend between additions then continue to beat the mixture until fluffy, about 3 minutes. Reduce speed to low. Add half of dry ingredients; mix until almost blended. Add milk and sour cream; mix until almost blended. Add remaining dry ingredients; mix until batter is blended and smooth. Stir in crystallized ginger. Pour into prepared pan. Tap pan gently on counter to even out. Bake until a tester inserted near the center of cake comes out clean and cake is dark golden brown and has begun pulling from sides of pan, 65-70 minutes. Transfer pan to a wire rack and let the cake cool in pan for 25 minutes. Invert cake onto rack and let cool completely, about 1 hour. This cake can be made 2 days ahead and stored airtight at room temperature. Dust cake lightly with powdered sugar. 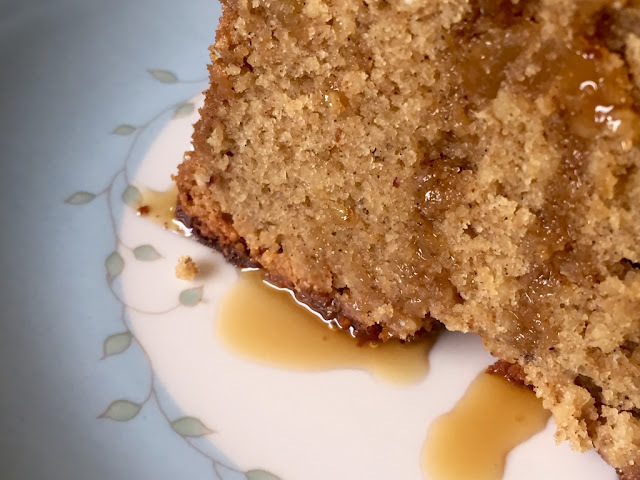 Drizzle caramel sauce over cake, allowing it to drip down sides and into grooves and crevices. Serve remaining sauce alongside. Combine sugar, cream of tartar, and water in a medium saucepan over medium heat, stirring until sugar dissolves. Cook, without stirring and occasionally swirling pan for even cooking, until mixture turns a dark amber color; remove from heat. Slowly add apple juice, cream, brandy, vanilla, and salt (mixture will bubble vigorously), whisking to combine. Return pan to medium heat and bring to a vigorous boil. Reduce heat to a simmer and cook, stirring to dissolve any caramel bits, for 1 minute. Remove from heat and let cool. Set aside. Caramel sauce can be made 1 week ahead. Cover and chill. Re-warm slightly before using. Love those warm spices as well, Felice! I would say the caramel sauce is a must! And that IS a beautiful Bundt pan. I am so glad that friends who understood just what would lift your spirits sent it to you. 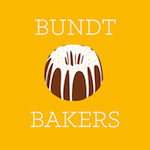 We've missed you at Bundt Bakers for sure! This cake looks absolutely heavenly! I love the chunks of ginger visible in the cut slice. Yum! Such a lovely story about the pan too- it sure is a beautiful one! I am a huge fan of ginger too, in all forms, so your cake sounds perfect to me, especially with that caramel sauce! This or not, I bet it tastes amazing :). This cake looks lovely! I really need to add this pan to my collection! Crystallized ginger is a 'must-have' ingredient in my pantry so I was doubly excited to see it in the cake along with the ground ginger. 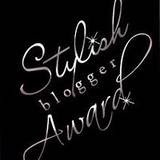 It looks absolutely fabulous! This cake looks awesome! Love your bundt pan too! I'll have to look into your group come January. It sounds like so much fun! Happy holidays! Oh wow that looks so moist and good. I'm all over ginger spiced anything, especially cakes.